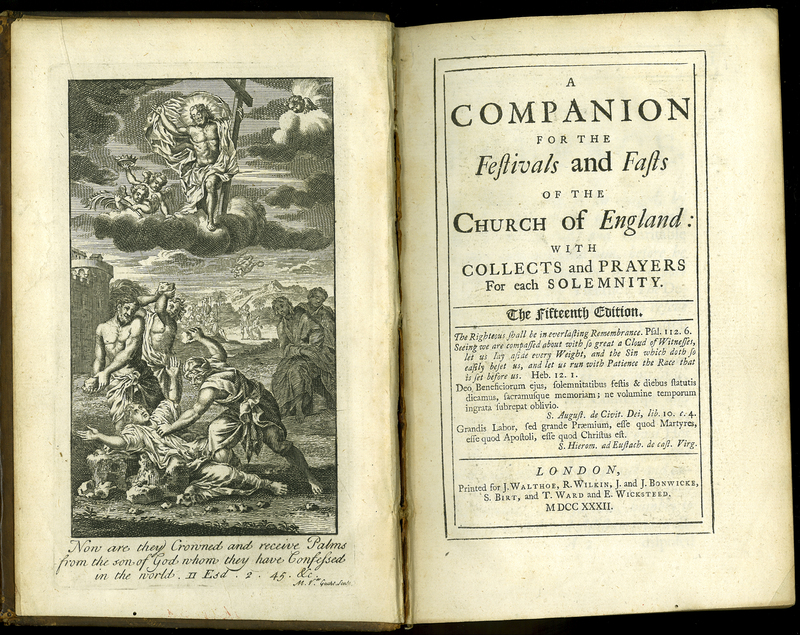 Robert Nelson’s (1656-1715) Companion is a catechetic work intended for use as a guide to the ‘Festivals and Fasts of the Church of England’. The frontispiece of this edition shows two Saints of the Church in the act of martyrdom. In the foreground, Stephen, who was falsely accused of blasphemy, is being stoned to death; and in the background, James the Greater, one of Jesus’ Apostles, is being beheaded by Herod Agrippa (11BC- 44AD). Above both of these scenes, angels appear holding crowns and palms, to be bestowed on the martyrs as they make their ascension into the Kingdom of God. This engraving, by Flemish engraver Michael van der Gucht (1660-1725), is a reworking of the same from a previous edition. Robert Nelson, “A Companion for the Festivals and Fasts of the Church of England: With Collects and Prayers for Each Solemnity. Fifteenth edition,” ourheritage.ac.nz | OUR Heritage, accessed April 20, 2019, http://ourheritage.ac.nz/items/show/10671.